The largest non-polar desert, the Sahara, which continues to expand south under the influence of global warming, will be halted by a 20-nation project to build the world’s largest horticultural feature, the Great Green Wall of Africa. The project will be supported by the World Bank, the African Union, the UN Food and Agriculture Organization and the UK Royal Botanical Gardens, which have together pledged $3 billion in addition to technical expertise. The Sahara covers 9,400,000 square kilometers in North Africa, and it continues to grow due to climate change, creeping into Senegal, Mauritania and Nigeria, according to the US Public Education website. Twenty African nations, led by Senegal will erect a wall of trees across the southern edge of the Sahara desert from the Dakar on the Atlantic Coast to Djibouti on the Gulf of Aden. The 7,600 km long, 15 km wide Great Green Wall will be the largest horticultural feature ever. In addition to the stopping the southward advance of the Sahara, the project will focus on sustainable farming, livestock cultivation and food security. For example, a 50,000 acre tree-planting initiative in Senegal focused on acacia trees, which produces gum arabic, a valuable commodity used as a food additive. Some of the trees planted are fruit bearing as well, which will help feed the rural interior of Senegal. 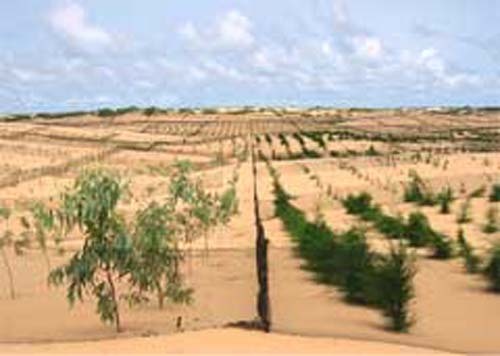 The Great Green Wall is expected to open up thousands of local jobs, as quality land and cultivation opportunities are created.